On 24 March, Maundy Thursday, Cardinal Vincent Nichols celebrated the Mass of the Lord’s Supper at Westminster Cathedral. The Mass remembers Christ’s institution of the Eucharist at the Last Supper and the washing of His disciple’s feet. In commemoration of Jesus’s act, Cardinal Vincent washed the feet of 12 Chelsea Pensioners during the service. The Papal Nuncio, Archbishop Antonio Mennini was also in attendance. In his homily, Cardinal Vincent began by talking about how during Holy Week ‘Jesus is being lifted before us, held before us’ allowing us to develop as Catholics. He went on to reflect on the washing of the Disciples’ feet, describing it as ‘a vivid picture of mercy in action’. He told the congregation how symbolic the action was, ‘it is, perhaps, the perfect Instagram. It says so much,’ alluding to Pope Francis recently joining the social media platform. In addition to the washing of the feet in the Mass, all the church bells were rung during the Gloria and will now remain silent until the Gloria of the Easter Vigil on 26 March. At the end of the Mass the Blessed Sacrament was solemnly processed from the Sanctuary to the Altar of Repose in the Lady Chapel of Westminster Cathedral. 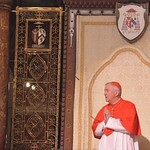 The full text of the Cardinal's homily is available to read here. Photos of the Mass are available to view here and here.